Notice the hazy skies and hot temperatures? You know what that means... Saharan dust is here! It's not uncommon for dust particles from the Sahara Desert to get caught up in the atmosphere and spread across the Atlantic. 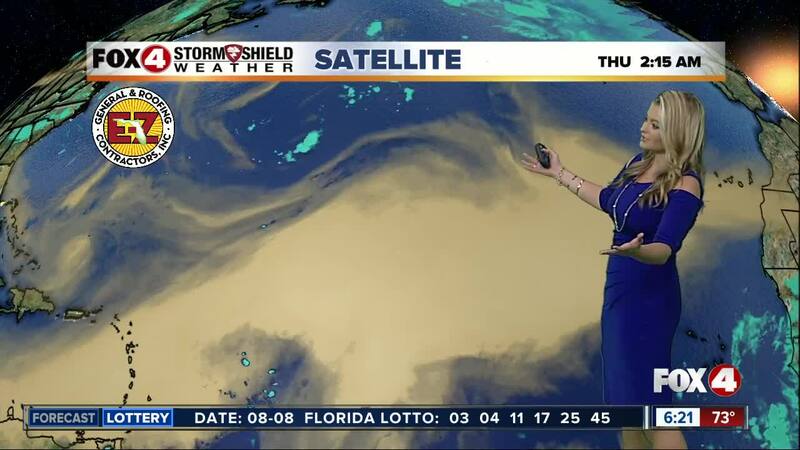 But a few times a summer, a thin layer of that Saharan dust is able to make the journey all the way across the Atlantic, impacting the skies over SWFL. The most obvious impact we see as this dust moves close to home are hazy skies rather than the crisp blue we see with other dry air masses. The haze is most apparent as a layer of gray as you look out over the horizon. The dust particles in the atmosphere can also help to dry out our conditions and lower afternoon storm chances. This, in turn, can keep temperatures a little steamier in the afternoon and evening hours. Another side-effect of the dust particles suspended in the atmosphere are more vibrant colors at sunrise and sunset. Sunlight reflects off the dust particles and helps the colors really pop, so expect a few postcard worthy sunsets over SWFL as we head into the weekend! The most beneficial impact of the Saharan Air Layer (or SAL) is the quiet conditions it brings to the tropical Atlantic. With a thick SAL in place, tropical activity tends to be stifled by the dry, stable air mass, limiting any potential development. This has been a major player in the quiet conditions we've seen so far this season. A prominent SAL has been in place for the majority of the summer, keeping activity in the Main Development Region at a minimum up until this point. We are still making our way to the peak of the 2018 Atlantic Hurricane Season, typically right around September 10, but if we can keep the rounds of dust coming off Africa, it will help to keep this trend of a less active season in place. For those worried about dust particles making allergy or asthma symptoms worse, the dust particles are suspended high enough and the layer is thin enough that it typically doesn't pose much of a risk. The layer of dust is expected to hang around through the end of the work week and clear out heading into this weekend with storm chances increasing again by Saturday-Sunday. If you take advantage of the dust contributing to the colorful sunrises and sunsets, we'd love to see them! You can post weather photos to our Fox 4 Facebook page or email them to me at dani.beckstrom@fox4now.com.